Are you getting stuck with how to treat clients who have chronic pain? Are your clients experiencing pain but the cause is unknown? It's frustrating for you as a clinician, and painful and debilitating for your clients. 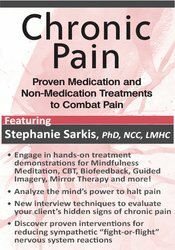 Join Dr. Stephanie Sarkis, psychotherapist, author, and international speaker, as she shows you concrete, research-based solutions using real-life examples of chronic pain relief in clients. She will show you how to create effective tailor-made treatments to decrease related stress, anxiety, depression, pain related ailments, and possible suicidal tendencies. You will also learn acupressure techniques, discover how to create an effective guided imagery script, role play cognitive-behavioral therapy techniques, and see examples of mirror therapy for chronic pain. Explain how CBT treats for chronic pain. Discover pain as a learned response. Assess chronic pain sequalae in your clients. Evaluate your client's hidden signs of chronic pain. Analyze the mind's power over pain signals in the body. Create cognitive behavioral homework assignments for clients. Access resources on chronic pain for clients. Explore how pain relief impacts daily functioning. This self-study course has been approved by PESI, Inc., as a NAADAC Approved Education Provider, for 6.0 CE in the Treatment Plan skill group. NAADAC Provider #77553. PESI, Inc. is responsible for all aspects of their programming. Full attendance is required; no partial credit will be awarded for partial attendance.